There was a major victory for the “right to repair” movement, as Vice points out, which gives the public more leeway to fix their own devices even if the means that they have to break DRM in the process. In addition, there’s also an important update related to the preservation of abandoned games. 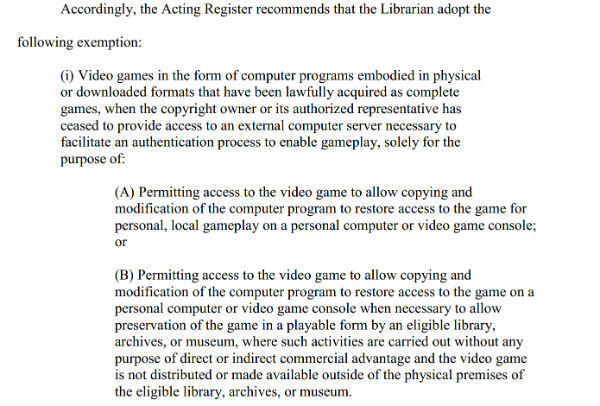 To preserve these games for future generations and nostalgic gamers, the Copyright Office previously included game preservation exemptions. This meant that libraries, archives, and museums can use emulators and other circumvention tools to make old classics playable. 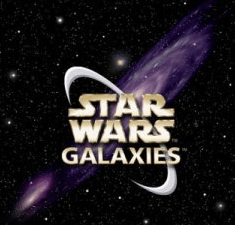 However, these exemptions are limited and do not apply to games that require a connection to an online server, which includes the most recent games. When the online servers are taken down, the game simply disappears forever. To address this, several game fans including San Francisco’s Museum of Art and Digital Entertainment (The MADE) urged the Copyright Office to expand the DMCA exemptions to online games. And with the release of the new exemptions, game archivists gained some new freedoms. The new exemptions will allow preservation institutions who legally possess a copy of a video game’s server code and the game’s local code, to break DRM and other technological restrictions to make these playable. This type of “tinkering” is seen as fair use by the Government, which rejects critique from the major game companies who fear that this may hurt sales of the games they sell. The MADE founder Alex Handy informs TorrentFreak he is happy with the decision but notes that there still is a long way to go before all games can be legally archived. “While this exemption does not necessarily fix all the problems that are out there in the difficult realm of digital preservation, it is another step forward toward reforming our extremely restrictive digital copyright laws,” Handy tells us. The exemption process generally moves slowly but for game preservationists, this is certainly a step in the right direction. Handy notes that the Copyright Office put a lot of work into their review, but that it may not fully understand what’s at stake here. Without proper exemptions to legally archive works, many games are at risk of being lost forever. “When George Martin was asked why he hadn’t saved more Beatles outtakes and recordings, he responded that he didn’t know anyone would care about those things in the future,” Handy says. This was also illustrated by James Clarendon, software development manager at Amazon, during a hearing on the exemptions earlier this year. He worked for 2K Games in 2012 and was confronted with this problem when the company wanted to reissue their megahit BioShock after five years. “The problem was, was that no archive of that game existed and nobody had actually put in the time to build an archive for that. We had to scour people’s machines, artists, engineers, everybody’s machines to find the missing pieces and put it back together,” Clarendon said, adding that they didn’t manage to reissue the full original. The MADE says that it will continue work to widen the exemptions until all games can be properly archived. That will likely take a few more hearings, at a minimum, but they believe it’s worth the effort. “The MADE is thankful for everyone who helped out in this project, including our friends in the industry, the folks at Reddit’s PCMasterRace and our lawyers from UC Berkeley,” Handy says. A full overview of the Copyright Office’s final rules is available here (pdf). This also includes a new DMCA circumvention exemption for filmmakers to rip a DVD or Blu-Ray disc, beyond the documentary genre, although that remains limited.